Click to enlarge. IBM just announced new technologies designed to help companies and governments tackle Big Data by making it simpler, faster and more economical to analyze massive amounts of data. New data acceleration innovation results in as much as 25 times faster reporting and analytics. IBM made a significant announcement earlier today concerning new technologies designed to help companies and governments tackle Big Data by making it simpler, faster and more economical to analyze massive amounts of data. The new data acceleration innovation results in as much as 25 times faster reporting and analytics. Today’s announcement, which represents the work of hundreds of IBM developers and researchers in labs around the world, includes an industry-first innovation called “BLU Acceleration,” which combines a number of techniques to dramatically improve analytical performance and simplify administration. Also announced was the new IBM PureData System for Hadoop, designed to make it easier and faster to deploy Hadoop in the enterprise. Hadoop is the game-changing open-source software used to organize and analyze vast amounts of structured and unstructured data, such as posts to social media sites, digital pictures and videos, online transaction records, and cell phone location data. The new system can reduce from weeks to minutes the ramp-up time organizations need to adopt enterprise-class Hadoop technology with powerful, easy-to-use analytic tools and visualization for both business analysts and data scientists. In addition, it provides enhanced Big Data tools for monitoring, development and integration with many more enterprise systems. As organizations grapple with a flood of structured and unstructured data generated by computers, mobile devices, sensors and social networks, they’re under unprecedented pressure to analyze much more data at faster speeds and at lower costs to help deepen customer relationships, prevent threat and fraud, and identify new revenue opportunities. BLU Acceleration enables users to have much faster access to key information, leading to better decision-making. The software extends the capabilities of traditional in-memory systems — which allows data to be loaded into Random Access Memory instead of hard disks for faster performance — by providing in-memory performance even when data sets exceed the size of the memory. During testing, some queries in a typical analytics workload were more than 1000 times faster when using the combined innovations of BLU Acceleration. Innovations in BLU Acceleration include “data skipping,” which allows the ability to skip over data that doesn’t need to be analyzed, such as duplicate information; the ability to analyze data in parallel across different processors; and greater ability to analyze data transparently to the application, without the need to develop a separate layer of data modeling. Another industry-first advance in BLU Acceleration is called “actionable compression,” where data no longer has to be decompressed to be analyzed. The new offerings expand what is already the industry’s deepest portfolio of Big Data technologies and solutions, spanning software, services, research and hardware. 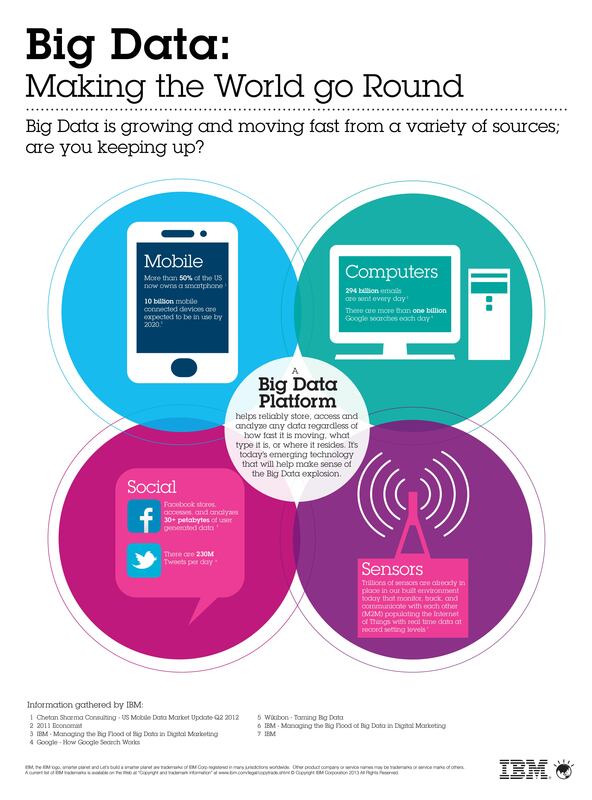 The IBM Big Data platform combines traditional data warehouse technologies with new Big Data techniques, such as Hadoop, stream computing, data exploration, analytics and enterprise integration, to create an integrated solution to address these critical needs. IBM PureData System for Hadoop is the next step forward in IBM’s overall strategy to deliver a family of systems with built-in expertise that leverages its decades of experience reducing the cost and complexity associated with information technology. This new system integrates IBM InfoSphere BigInsights, which allows companies of all sizes to cost-effectively manage and analyze data and add administrative, workflow, provisioning and security features, along with best-in-class analytical capabilities from IBM Research. A new version of InfoSphere BigInsights, IBM’s enterprise-ready Hadoop offering, which makes it simpler to develop applications using existing SQL skills, compliance security and high availability features vital for enterprise applications. BigInsights offers three entry points: free download, enterprise software and now an expert integrated system, IBM PureData System for Hadoop. A new version of InfoSphere Streams, unique “stream computing” software that enables massive amounts of data in motion to be analyzed in real-time, with performance improvements, and simplified application development and deployment. A new version of Informix including TimeSeries Acceleration for operational reporting and analytics on smart meter and sensor data. All offerings are available in Q2, except the PureData System for Hadoop, which will start shipping to customers in the second half 2013. Credit-qualified clients can take advantage of simple, flexible lease and loan packages with no up-front payments for the software and systems that deliver a new generation of data analytics. IBM Global Financing offers attractive leasing programs with 90-day payment deferrals for the PureData System for Hadoop, as well as zero percent loans for the broader portfolio of IBM big data solutions.